Middlesex's pre-season got underway on the field yesterday with the start of their first match of 2019 - a two-day red-ball friendly against Hampshire at the Ageas Bowl. With the intention of the game to play hard, but ultimately get overs into the bowlers legs and time in the middle for the batsmen, both sides agreed to extended squads being available for the match - with Middlesex selecting eighteen players to be involved. 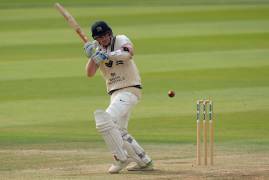 With a format agreed of 55 batting overs for one side and then 35 batting overs for the other on both days, it was Middlesex's turn to enjoy the longer innings on the opening day, with Sam Robson and Nick Gubbins kicking off proceedings for the visitors. Tough conditions, with a somewhat expectable March chilly breeze in the air, made batting hard going on the opening morning, and after a steady start for Middlesex Nick Gubbins fell to former teammate Gareth Berg for 7, with Tom Alsop taking the chance with the visitors score on 16. Stephen Eskinazi joined Robson and the pair set about meeting all the objectives of the game - both facing plenty of deliveries and spending good time at the crease. Robson celebrated the club's first half-century of the year, bringing up his fifty off 103 balls, before he retired out on 53. Eskinazi too retired out soon after, having faced 99 balls for his well worked knock of 35. Eoin Morgan and Max Holden picked proceedings up in the middle and by the time Middlesex's innings of 55 overs came to a close, Morgan had notched up an unbeaten 30 and Holden 10. with Middlesex closing their innings on 141 for 3! With the ball, the return to fitness and form of the Finn, Helm, Roland-Jones trio made a swift and powerful impact as they wreaked havoc with the new ball! 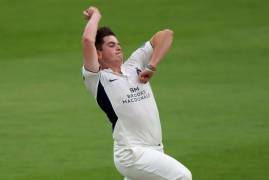 By the middle of the fifteenth over of the hosts reply they lost their fifth wicket, with the score on just 37, as all three Middlesex pacemen found good rhythm on their first outing of the year. The Figures of 1 for 12 off 4 overs for Finn, 2 for 9 off four for Helm and 2 for 2 off 4 for Roland-Jones have already hinted that there is plenty to be encouraged by for the season ahead. A wicket apiece for Ethan Bamber and George Scott saw Hampshire finish the innings on 103 for 7 from their 35, with Middlesex claiming the higher ground on the opening day. The players will return to do it all again tomorrow, with Hampshire batting first from 10.30am.